Odo /ˈoʊdoʊ/, played by René Auberjonois, is a fictional character in the science fiction television series Star Trek: Deep Space Nine. He is a member of a shapeshifting species called Changelings and serves as the head of security for the space station Deep Space Nine on which the show is set. 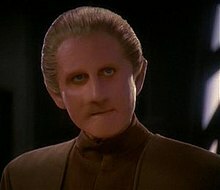 Intelligent, observant and taciturn, Odo uses his unique abilities throughout the show to maintain security on the DS9 station and, later, aids the Bajoran people and the Federation throughout the Dominion War against his own people, the Founders. Late in the fifth season, in the episode “Children of Time”, an Odo who has lived an additional 200 years tells the “current” Kira Nerys that he has loved her from the time their friendship first began. With this revelation, Kira and the “current” Odo eventually become a couple. In the Mirror Universe, Odo is the supervisor of the mining complex at Terok Nor. He is a brutal taskmaster over Terran slaves there and tolerates no deviation from his strict rules. Relatively little is known of him, as no one in the Mirror Universe is aware that the wormhole exists or who Odo's people are. During a mining accident, Odo begins an evacuation of the Terran workers from the complex. Julian Bashir, seizing the opportunity to escape, disintegrates him with a disruptor. In this reality, Odo has his own set of rules called the "Rules of Obedience" and quotes one of the rules in the same way that regular universe Quark would quote his "Rules of Acquisition". After filming of the episode "Crossover", which was mirror Odo's sole onscreen appearance, actor Rene Auberjonois liked the alternate uniform so much he began wearing it while playing the regular universe version of Odo as well. In the initial Deep Space Nine relaunch novels, Odo is succeeded as security chief by Ro Laren, who is working for the Bajoran Militia. He also sent a Jem'Hadar ambassador to the Alpha Quadrant to foster understanding in the Dominion of other cultures, and soon returned to DS9. In the Star Trek: Deep Space Nine - Millennium series of novels, it is revealed that Odo rarely shifted into smaller forms such as insects due to a psychological block from his original "training" under Doctor Mora. The novel series also speculates that the Founders placed a mental block on Odo's abilities to make it difficult for him to alter his face, thus explaining why he can never get faces quite right, even after linking with other Changelings on several occasions. In the Star Trek: Terok Nor novel Night of the Wolves, Odo was found in a spherical module in the Denorios Belt by the Cardassian vessel Kevalu, which was under the command of Dalin Malyn Ocett, in 2345. In the Star Trek: Typhon Pact novel Raise the Dawn, Odo returned to the Alpha Quadrant to help Sisko investigate reports that the Typhon Pact, an alliance of the Federation's enemies, have stolen Jem'Hadar technology to perfect their own quantum slipstream drive, only to be trapped in the Alpha Quadrant when the wormhole was seemingly destroyed thanks to Kira's attempt to stop a Typhon Pact ship from using it again. Sisko offered Odo a place on his new ship, the Robinson, but the novel ends with Odo deciding to remain on Bajor for a time to think about what he will do next. In 2009, IGN ranked Odo as the seventh best character of Star Trek overall. They note the character's search for identity, even as he struggles to maintain order the space station. They highlight his relationships with Sisko, Quark, and Kira on the station, and that he can turn into any shape except a normal human form. In 2018, The Wrap ranked Odo as the 8th best main-cast character of Star Trek overall, noting his struggles with loyalties. ^ "Star Trek Deep Space Nine Pre-Premiere Bible". Trek Writer's Guild. Retrieved 2018-03-11. ^ "Catching Up with DS9's Rene Auberjonois, Part 1". StarTrek.com. Retrieved 2018-03-11. ^ Perry, S.D. (May 1, 2001). Avatar Book One of Two. Star Trek. p. 284. ISBN 0-7434-0050-X. ^ Reeves-Stevens, Judith; Reeves-Stevens, Garfield (2002). Star trek, deep space nine millennium. New York: Pocket Books. ISBN 0743442490. OCLC 48747215. ^ Perry, S. D.; Dennison, Britta (2008). Night of the wolves : 2345-2357. New York: Pocket Books. ISBN 0743482514. OCLC 891892452. ^ George III, David R. (2012). Raise the dawn. New York: Pocket Books. ISBN 1451649568. OCLC 851699974. ^ "Top 25 Star Trek Characters". IGN. 2009-05-08. Retrieved 2019-03-20.